Max will turn 3 in a couple of weeks, and this wonderful boy is in need of a new home. His owners loved him dearly and took excellent care of him. Max will turn 3 in a couple of weeks, and this wonderful boy is in need of a new home. His owners loved him dearly and took excellent care of him, but his Daddy has had 5 surgeries and is going to need more and it was just too much for everyone to handle. Max is great with children,cats,dogs and is housebroken and mostly well mannered (he does like to jump on you to say Hello). He has had a wonderful life with very caring people. Max could use a little weight loss regimen... he is a bit on the porky side! If you think you are the perfect home for Max, have an application on file and email us! Home, reference,vet check apply as well as adoption fee. We prefer to only adopt within a 2 hour distance of St. Louis MO. 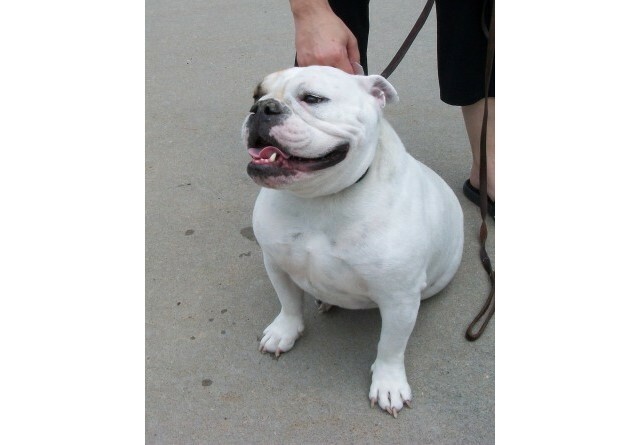 Thank you for helping a Bulldog in need!